In OUR business, however, it’s ALWAYS . . . VERY PERSONAL! Alice Cohen was a client of mine. She died May 5, 2010. I first met Alice 15 years ago when she was referred to me by a physician who worked with her at a large medical clinic. From that day, throughout the many years she frequented our office she spread her sunshine, warmth and positive spirit. She blessed us with her trust and we did our best to give her guidance through the ups and downs of financial markets. Through her long struggle with failing health she continued to inspire us and we did our best to make sure her wishes and objectives were met. Her passing was a reminder to me how personal this business truly is. It reminded me how fleeting our life, our relationships and our businesses may be. WE ARE BLESSED WITH THE LIVES OF MANY CLIENTS, WHO, LIKE ALICE TRUST US WITH THEIR VERY PERSONAL GOALS, STRUGGLES, TRIUMPHS AND HOPES. OUR MISSION IS TO HELP EACH OF OUR CLIENTS ACHIEVE THE OUTCOMES THEY DESIRE. This artwork has great significance to me. You’ll see it hanging in our office. It serves as a metaphor to me when I think of our business responsibility to you, our clients. We want to sail with you, in good times and in bad, in easy breezes and in the storms. 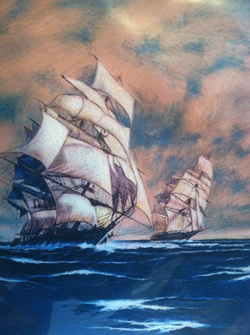 We want to provide preparation, guidance and experience and support as we sail together toward the outcomes you desire. It’s a privilege for us, we take it seriously…this is our mission… it’s not just business…it’s personal! !